Telling children to eat their vegetables is one thing. Showing them where their vegetables come from, and letting them pluck them off the vine and yank them out of the ground, is something else altogether. Judging from a group of youngsters who visited Eno Terra One Acre Canal Farm in Kingston last week, the latter approach is working. There were no turned up noses or exclamations of “ugh” or “gross” among these future gourmands as they sniffed bunches of chives and learned how to handle hot chili peppers. 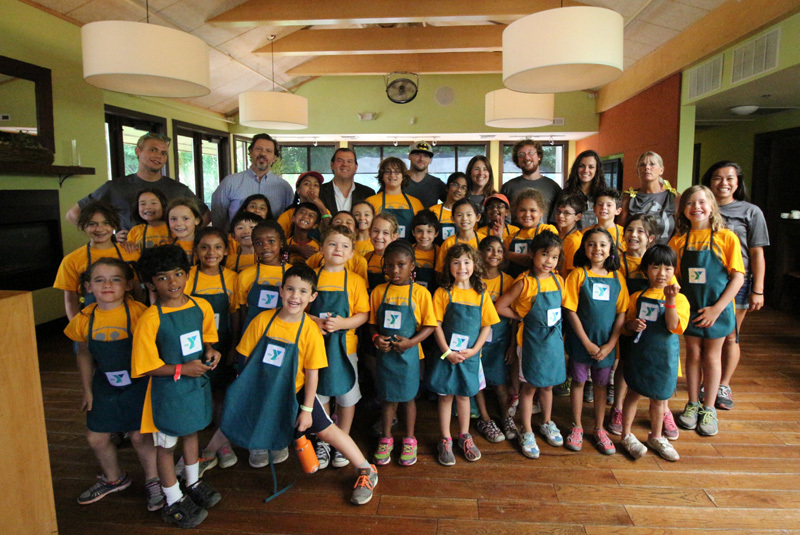 For 32 kids from the Princeton Family YMCA’s Specialty Camps, the farm was the last stop on a two-week tour of local eateries, most of which are owned by Raoul and Carlo Momo. Before heading back to the Y, they were treated to a cooking demonstration followed by a lunch of meatball sandwiches with fresh cucumber and dill salad at the Momos’ restaurant Eno Terra. The Y’s Specialty Camps focus on a different topic each week. The idea is to provide intense exposure to children aged 6-11 who have a strong interest in a variety of subjects, from art to animal conservation. Special guests join the children to talk about their areas of expertise. Field trips such as the excursion to the farm are a highlight of most sessions. The ever-popular cooking camp is the only topic that takes up two weeks instead of one. The campers are divided into two age groups for some activities. The older ones got a chance to spend time at The Savory Spice Shop. Both groups learned knife skills from chef Terry Strong at Mediterra, and baked bread at Terra Momo Bakery. Other eateries hosting them during the week were Jammin’ Crepes and House of Cupcakes. Eno Terra One Acre Farm takes up a small fraction of what was once a vast nursery in Kingston. The school bus carrying the campers turned off Mapleton Road and rumbled down a rutted dirt road, along the canal, to the clearing where rows of vegetables grow. Ready to welcome them was Alex Martin, a British-born chef/farmer who once worked with chef Jamie Oliver. Carlo Momo also weighed in. “How many of you have been on a farm?” he asked the campers. Several hands shot up. “There’s nothing better than having food right from the farm and knowing where it came from,” he said. Each of the children was given some vegetables to take home before boarding the bus back to Eno Terra, where sous chef Frank Caponi and executive chef Joseph Voller were waiting to give them a brief demonstration before sending them upstairs for lunch.